Beyond simply a place to sit down for everyone our lack of seating is actually creating a dangerous situation. 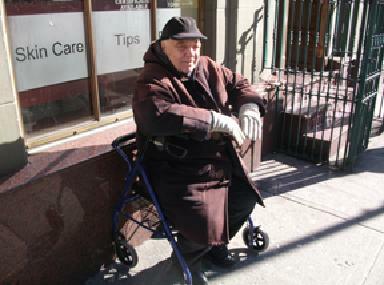 Our senior citizens must wait on our street corners to be picked up by access a ride. I had a personal experience of my mother having just had open heart surgery waiting for an access a ride pick up standing on a street corner for over an hour. Unite Here has a medical facility on 7th Ave between 25th and 26th streets. After examinations I found people waiting for a pickup of access a ride. They too were waiting up to an hour or more and had no place to sit while waiting. My friend John needed a walker to sit on after a knee operation. Today several years later he no longer needs the walker but he still uses it. He does this because he learned that if he positions himself on 8th Ave friends would stop by and talk with him. He needed to created his own street seating to do so because there is none near where John lives. PlaNYC 2030 talks about having a park within 10 minutes walking distance of every citizen in New York City. For some seniors and disabled a 10 minute walk to a Centralized park. is 10 minutes too much..Park Chelsea is meant to place park facilities for people within a minute or two walk of everyone in Chelsea. My friend Adelle was in her 90s and had trouble getting around. She was a gardener in the Penn South intergenerational garden that just happen to be located around the corner from where she lived. Given her luck in it being around the corner she was able to travel to it on a regular basis. If it was even five blocks away I don't think this would have been possible. The beauty of the Park Chelsea concept is that Park Chelsea will offer gardening opportunities for our senior citizens not 10 blocks away, not five blocks away but on the block where they live. 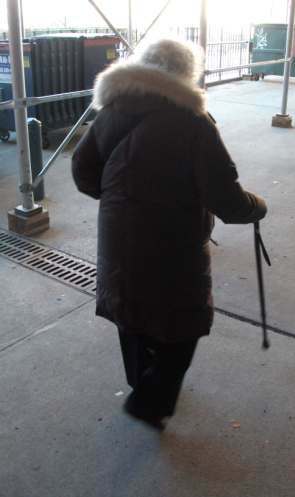 I know of an older woman who has a tremendous amount of trouble walking , She lives on the fifth floor of a walk-up so she can not use a walker. To be able to go outdoors and get around she would use a nearby building ledge and a nearby bench in her neighborhood to sit on. The bench was taken away, the building ledge is currently covered by scaffolding. She is. now effectively stuck in her house far more than she would like to be. For the able-bodied people in our community nearby outdoor seating locations may be considered optional, for others such as this woman they are a necessity. I noticed the woman in the picture below having a tough time walking. I asked her if seating on every block would be helpful. Her answer was a very strong affirmative. 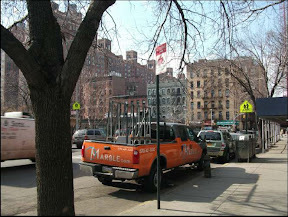 I talked to a good number of seniors in Chelsea and asked if seating on every block would be something they desired. Except for one woman who said no everyone else answered yes. Some had the opinion though that it would never occur. My mom (3rd from left) lives in Flushing. 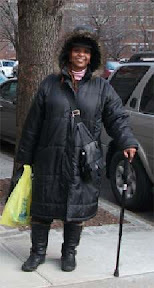 Recently the bus service that stopped around the corner from her was discontinued due to MTA budget problems.Due to this she can no longer easily get to her local senior center. For my mom and these other residents of her building the bench area around the corner of her apartment has become a "Naturally Occurring Senior Center"(NOSC). Park Chelsea plans to create NOSC's through Chelsea. In talking to users of this NOSC I learned what they would really like is a table and movable seating so that the NOSC can go beyond being just an an area for schmoozing and also be used for playing card games. 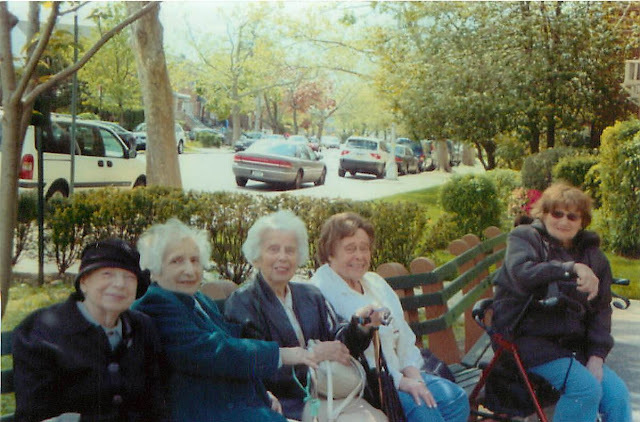 Below are two photos from another Naturally Occurring Senior Center this one on 97th St in the Lotus community garden. Here are two senior citizens who are playing a game of Scrabble. Given a simple addition, a table and chairs this NOSC has transformed from an area where the seating arrangement would only allow talking and reading to where the seating arrangement will allow for games and other group activities. Rather then just seats, Park Chelsea recommends the creation of NOSC's, so that beyond a place to sit, seniors have places to interact. East Harlem became the city’s first “aging improvement district.” Sixty businesses set up chairs on the sidewalk for seniors to rest in, a Senior Health Fair was celebrated and the local pool offered “senior swim” hours. Think of seating and restrooms as located at Oasis's, We need to let our neighbors know how to find these. On every block in Park Chelsea we need signage that will let people know where the nearest seating is, where the nearest publicly available restroom is.